Established in 1991 by the Ministry of Foreign Affairs and Trade of the Republic of South Korea,KOICA is responsible for Official Development Assistance (ODA) to enhance the effective delivery of South Korea's technical cooperation and aid programs to developing countries. 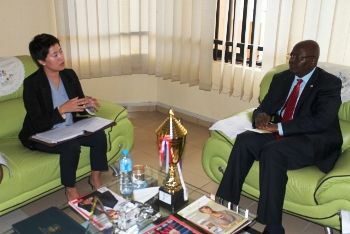 According to a release from the Liberian Embassy in Abuja, the KOICA Country director disclosed that Liberia has been included as a beneficiary of the World Health Organization (WHO) project on Neglected Tropical Diseases (NTD’s). The project, according to the release, is implemented in collaboration between the WHO Headquarters in Geneva, Switzerland and KOICA Headquarters in Korea. Also, five Liberian participants have been nominated to participate in the KOICA-AU Short Training scheduled for this month in South Korea,the release adds.